Ashraf has been driving an Innova for eight years. He loves it. He loves it for its car like-feel. He loves the fact that it can go over all kinds of terrain without breaking a sweat. He loves it for the effortlessness with which he can drive long distances out of the city. Ashraf, in case you are wondering, is one of CNBC-TV18's drivers who regularly drives out for our TV shoots. NowAshraf has a new option. And it comes from the same region, geographically speaking, as his Toyota. I'm talking about the Nissan Evalia. 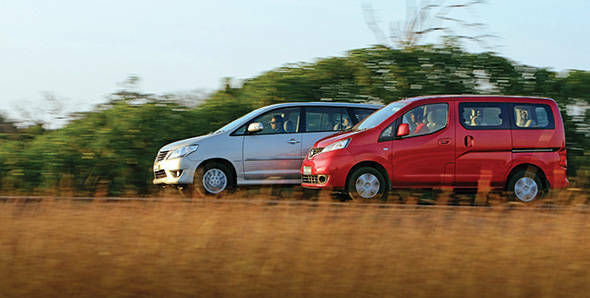 The Qualis is the car that singlehandedly turned around the MPV segment in India. The Innova took over from where the Qualis left off and raised the bar high enough to set a benchmark that very few have matched up to. And it's not just fleet owners who swear by the Innova. Private owners too have nothing bad to say about it. But has the Evalia got what it takes to make a stand in the segment the Innova defines? The Evalia is the new kid on the block and styling wise it does look the part. Up front, the look is trademark Nissan thanks to the grille arrangement. It is a smart design that makes the Innova look a bit long in the tooth. But move to the side and you'll notice something strange. The Evalia kind of looks like it was designed for a flat bed loading bay at the back, which was later given a roof and two windows to make it, as Nissan calls it, an Urban Class Utility Vehicle. But this is not to say that it is bad looking. It is just not spectacular to look at, is all. The rear again does not have a lot going for it. It is a bare basics design with Scorpio-esque tail lamps and the requisite badges. The Innova isn't bad looking but it is now a bit too familiar. It's looked more or less like this since 2005, and despite the face lift at the end of last year, the newer cars seem to amplify the need for a thorough, deeper than skin refresh. The Evalia looks more like a van than the Innova. Part of the reason is that it opts for a tall-narrow stance compared to the Innova's shorter-wider format. This is further reinforced by the slab sides which tend to appear in the cheaper vans or cargo-oriented MPVs vastly more often than on private owner people carriers. And the Innova's side body curves just enough towards the roof to avoid this perception. The difference in width is a big one. It is immediately apparent when you climb into the Innova - there is more shoulder room than the Nissan, which hits back with more headroom for the passengers. But it is inescapable that the Evalia could have done with better interiors. Part of the problem is attention to detail. For example, the front passenger footwell has a big intrusion from the in-dash cargo space (I can't call it a glove compartment because it is lid-less) so getting comfortable is tough. Tall passengers will prefer to sit in the middle row as a result. In the second and the third row - the life of the van as it were - both offer similar space with some flexibility in the seating options. But the Innova's second row slides which allows you to adjust the knee room between the second and third rows. The Evalia squanders precious room for the feet in the third row with the placement of the seat mounts which stop you from sliding your feet under the seat and stretch a crucial bit. The third row in most Indian cars isn't anything to sing about anyway but the Innova is less of a punishment because the actual seats are actually pretty good. The Evalia then claws back some ground offering more room aft of the third row with a lower loading lip. As you can see, the Nissan has sliding doors which are great for getting in and out in tight parking spaces. But the problem is that doors do not have windows that open beyond a small crack for ventilation. And chances are you'll spend a lot more time in the car rather than getting in and out. But the problem really is that windows are actually quite small which makes the cabin feel a bit claustrophobic. The design of the interior itself is pretty straight forward. The steering wheel is near-horizontal - another minivan cue - which I am not a fan of either. But all this doesn't do the Nissan any favours because the Innova's hides its MPV role inside rather well. It feels like a car, the cabin wraps around the driver nicely and makes the Nissan, in comparison, a basic minivan. Material quality is better in the Toyota too. The only area where the Innova is outperformed then, is the visibility from the driver's seat. The Evalia feels like an IMAX movie after spending time in the Innova - which isn't bad, but more like a normal movie theatre in comparison. The visibility does have an upside for the Nissan too - it makes it easy to drive in traffic. As far as kit goes, the Innova is definitely better endowed among the two. Where Nissan opts for a simple 1 DIN entertainment system mounted in the centre console, Toyota goes all out with touchscreen infotainment with Bluetooth and steering-mounted controls. Where Nissan (strangely) does not provide aircon vents for the second row, Toyota offers roof vents for both second and third rows. The Nissan doesn't even get day/night mirrors which even cars like the Santro get these days. The odds, then, are stacked against the Nissan. Too many design, material and spec choices create a utilitarian impression of the Evalia's interior and exterior and therefore it cannot crack the very key of the Innova's success - the feel of a premium car. The big difference in approach under the skin between the Toyota and the Nissan is this. The Toyota is old-school but superbly executed body on frame construction while the Evalia is a proper monocoque. but, where the Innova wears substantial (205s on 15-inch rims), even proportionate tyres, the Evalia runs with Swift-sized 165s on 14-inch rims. And the Toyota goes for a heavier steering feel where the Nissan offers a light, near effortless steering. How does that add up? In the real world, MPVs are primarily used to transport people and their luggage within and between cities. The light steering in the Evalia makes it easier to drive in the city. Even in heavy traffic, the car uses its great visibility from the driver's seat and its flat sides to squeeze in and out of tight spots with ease. The fly in the ointment is the stiffer suspension setup. On great roads, the Evalia is calm, composed and comfortable to sit in. But when the going gets rough, the Evalia gets roughed up. And this is what the Toyota has going for it. It feels confident on great roads and it remains far, far more composed when the roads ahead are in ruin. I see Innovas traipsing up and down the Manali-Ladakh highway but I find it hard to imagine an Evalia in the same role. For the simplest of reasons. The Innova works hard - and succeeds at - isolating the passengers from the shakes, judders and shocks that are part of the Indian terrain. If the Evalia were to be put on the same road, the passengers would feel the road a lot more than they would like. But the Innova isn't done just yet. When you do head out on great, well-surfaced highways, the Innova reveals the positives of its heavier steering. Get past 85kmph and the Evalia feels a bit flighty and fidgety, and all light-steering cars do this. The faster you go, the worse it gets. The Innova, on the other hand, feels as secure, planted and confident as it did at 40kmph nearing its top speed. To the point where you have to remind yourself that it is an MPV and not a car. Neither of the two, let us be honest, are expected to be anything more than secure feeling automobiles when it comes to corners. But the Innova's suspension and steering are yet to find a match among MPVs. The braking figures will tell you exactly this. The Innova comes to a halt from 100kmph in 43.2m while the Evalia takes 44.48m to stop. Not much? You're forgetting that the Innova is over 200kg heavier and it still comes to a halt faster than the Evalia. No doubt as to the winner on these parameters, then. The biggest spec gap between the two MPVs is the engine displacement - a full 1000cc. But the Innova's power and torque output isn't proportionately greater than the Evalia. The 86PS Nissan is just 16PS behind the Innova and they make the same peak torque, 200Nm, though the Innova holds its peak from 1400-3400rpm while the Evalia hits it at 2000rpm. In terms of sheer performance, the Nissan has the edge. It hits 60kmph in 5.88s, a full second ahead of the Innova while its 100kmph time of 14.63s is a full three seconds quicker. But get this, in fourth gear, the Innova just edges out the Evalia in roll-on acceleration. And that in sum, is the story of the two MPV's performance characteristics. Bigger engines feel less stressed and that is why the Innova's greater displacement is far from incidental. It makes the car easier to drive at higher speeds as well as sustained speeds. The Evalia to wit, by 85kmph sounds far more rushed than the Innova does. And when you load the cars up with people and luggage, the Innova is the car that shrugs off the additional load while the Evalia will threaten to stall unless you boost the revs before releasing the clutch from a standstill. But The Toyota doesn't have it all its own way. The Evalia's smaller displacement, thinner wheels and lighter weight do give it greater economy - 16.68kmpl to the Innova's substantially lower 11.8kmpl. So who wins on this parameter? If you're completely economy minded, the Evalia makes sense. But the Toyota offers the more realistic performance package when you consider the role the car is expected to play and will prove to be the more satisfying van to drive. The Toyota isn't cheap. At Rs 13.75 lakh (ex-Mumbai) it is just over Rs 3.5 lakh more expensive than the Rs 9.99 lakh Nissan Evalia. And that isn't pocket change. For your money, the Nissan offers an effective vehicle to transport you and your (extended) family from point A to B no matter where these points are on the map. The equipment levels are adequate and the only issue may be Nissan's fledgling network, a problem that becomes less of an issue with every passing day. But there is a reason the Innova is such a landmark in the segment. The extra money you would pay for the car will bring many things to your garage. The intangibles are things likes its proven, rock-solid reliability and shocking resale residuals. The tangibles include vastly better drivability, more load carrying ability, better handling, more road presence, better overall quality, a more comfortable cabin and an excellent and widespread service network. The Evalia is a good car for the money, but the Innova despite the price is a far more persuasive proposition and just the better overall automobile here. And that is why, if we were in the van market, our money would still be on the Toyota Innova.